Russell Sage Foundation, 9780871547958, 499pp. Liberal democracies are based on principles of inclusion and tolerance. But how does the principle of tolerance work in practice in countries such as Germany, France, India, South Africa, and the United States, where an increasingly wide range of cultural groups holds often contradictory beliefs about appropriate social and family life practices? As these democracies expand to include peoples of vastly different cultural backgrounds, the limits of tolerance are being tested as never before. 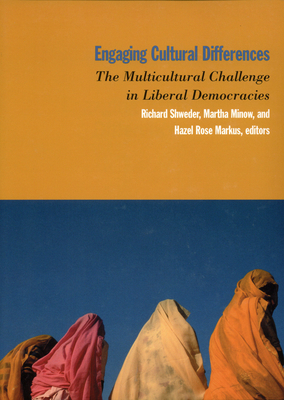 Engaging Cultural Differences explores how liberal democracies respond socially and legally to differences in the cultural and religious practices of their minority groups. Building on such examples, the contributors examine the role of tolerance in practical encounters between state officials and immigrants, and between members of longstanding majority groups and increasing numbers of minority groups. The volume also considers the theoretical implications of expanding the realm of tolerance. Some contributors are reluctant to broaden the scope of tolerance, while others insist that the notion of "tolerance" is itself potentially confining and demeaning and that modern nations should aspire to celebrate cultural differences. Coming to terms with ethnic diversity and cultural differences has become a major public policy concern in contemporary liberal democracies, as they struggle to adjust to burgeoning immigrant populations. Engaging Cultural Differences provides a compelling examination of the challenges of multiculturalism and reveals a deep understanding of the challenges democracies face as they seek to accommodate their citizens' diverse beliefs and practices. RICHARD A. SHWEDER, an anthropologist, is professor of human development at the University of Chicago. MARTHA MINOW is professor of law at Harvard University. HAZEL R. MARKUS is professor of psychology at Stanford University. CONTRIBUTORS: Richard A. Shweder, Martha Minow, Hazel Rose Markus, Caroline Bledsoe, David L. Chambers, Jane Maslow Cohen, Joanna Davidson, Arthur N. Eisenberg, Karen Engle, Katherine Pratt Ewing, Heejung S. Kim, Corinne A. Kratz, Maivân Clech Lâm, Usha Menon, Victoria C. Plaut, Alison Dundes Renteln, Lloyd I. Rudolph, Susanne Hoeber Rudolph, Lawrence G. Sager, Austin Sarat, Claude M. Steele, Dorothy M. Steele, Nomi Stolzenberg, Marcelo M. Suárez-Orozco, and Unni Wikan.